1. In a large saucepan, combine rice, water, and olive oil. Bring to a boil, reduce to a simmer, and cover. Cook for 35-40 minutes or until the rice is tender. Remove the rice from the pan and let cool. When cool, place in the refrigerator. Half of the rice is saved for a quick breakfast consisting of milk, rice, sugar, and cinnamon warmed in the microwave. 2. In a bowl, combine half of the cooked rice, green onion, basil, yogurt, mayonnaise, salt, and black pepper. 3. Fold in the chicken and peas. 4. 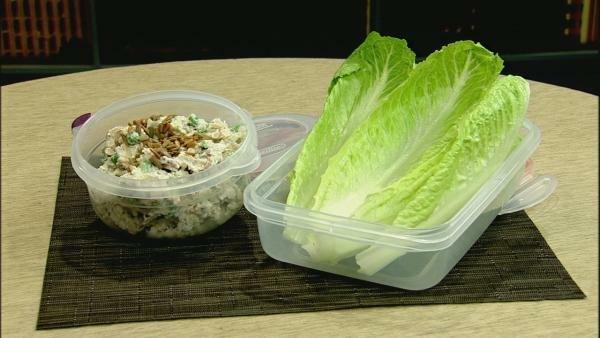 Pack the rice mixture with whole lettuce leaves and sunflower seeds separately in the lunch. Be sure to include a spoon. When ready to eat, simply spoon some of the rice mixture on the lettuce leaves along with sunflower seeds. Then roll up and eat!